Der Schulmeister von Eßlingen, from Heidelberg, Cod. Pal. germ. 848, Große Heidelberger Liederhandschrift (Codex Manesse), Zürich, c.1300-c.1340, fol. 292v. 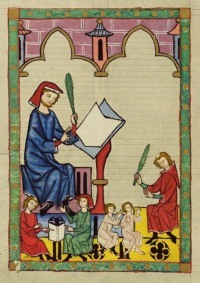 The MAA/CARA Summer Language Scholarships support graduate students and especially primising undergraduate students participating in summer courses in medieval languages or manuscript studies. The Medieval Academy of America’s Committee on Area and Regional Associations (CARA) is pleased to announce that the Summer Language Scholarship program has been expanded to allow more students to apply for support. The MAA/CARA Summer Language Scholarships support students participating in summer courses in medieval languages or manuscript studies. Applicants must be members of the Medieval Academy in good standing with at least one year of graduate school remaining and must demonstrate both the importance of the summer course to their program of study and their home institution’s inability to offer analogous coursework. Click here for more information. The due date for applications is 15 April. 1 September 2016 and 28 February 2017 is May 1. Click here for more information.